Enjoy Free Airport Shuttle Service to our Orlando Hotel. 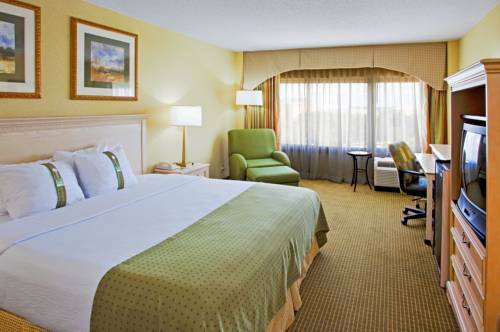 The conveniently located; Holiday Inn Orlando - International Airport is just one mile from the Orlando International Airport. Our hotel offers free shuttle service to and from the airport. Business guests will appreciate convenient transportation to and from Orlando International Airport and other guest amenities at this Orlando, Florida hotel. Access to Free Wi-Fi, a Business Center and our Internet Caf keep you working and connected so you dont have to worry about missing important emails. We also offer meeting and banquet spaces which can hold up to 425 people. Vacationers are a short distance from theme parks like the Walt Disney World Resort, Universal Orlando and Sea World Park along with other great destinations. We are also near the Citrus Bowl, Amway Arena, UCF Arena and Brighthouse Stadium for sports enthusiasts to cheer on their favorite team. Youll be amazed by the things you can do in sunny Florida. Return to the hotel for a comfortable stay and activities for the family. Parents and kids can spend time playing on the fully-lit tennis and basketball courts. Relax in our outdoor pool and hot tub. We offer a nice atmosphere for you all of your business and leisure. Make reservations with us today! Casual steakhouse chain known for grilled beef and other American dishes in a ranch style space. Air-Wall divides this room into three sections, A, B, and C.
Air-wall divides into A, B, and C and can be used as breakout rooms for smaller educational meetings. Home to some of Orlando's biggest superstars Universal Studios Florida, The Wizarding World of Harry Potter, Islands of Adventure, and the brand new Volcano Bay waterpark should be at the top of your to do list whe you're visiting us in sunny Florida.